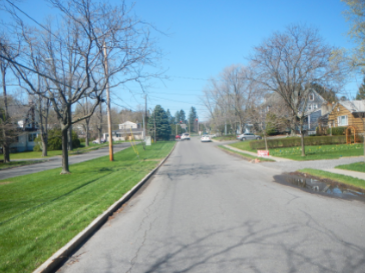 The Town of Geddes proposes a green infrastructure project to retrofit the median along Parsons Drive with an underground infiltration trench. Curb cuts will be installed in the curbing around the north median and around the south median. Existing trees in the median will be left there along with additional landscape plantings resistant to frequent inundation to be added along the low area near the infiltration trench. An infiltration trench system will also be extended along Granger Road from Breakspear Road east to West Manchester to reduce flows going to the Bronson Road system. Perforated pipe will be installed in the infiltration trench along the side of the road, with catch basins near the intersections. The grates on these catch basins will be several inches above grade so they only take in water during large storms.